6-month unlimited mileage limited warranty. 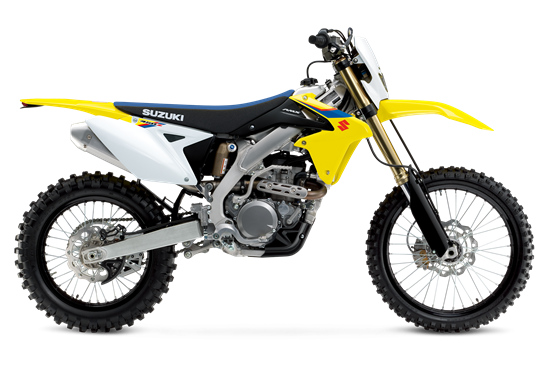 Fuel-injected engine is based on Suzuki's winning open-class motocrosser, the RM-Z450. Trail-ready features include an electric starter powered by a compact battery (plus kick-start back-up), a coolant reservoir tank, and an engine protector plate. The airbox features a hinged lid for quick air filter maintenance. Bright 35-watt headlight is smoothly incorporated into the front number plate. The full-function, dual (sport/standard) mode instrument cluster is in a durable, ultra-compact housing. Sport mode simply shows timer, tripmeter, average speed, and tire-diameter correction (to reduce information during spirited riding or competition). Standard mode also shows speed, time, two trip lengths, and voltage. The instrument’s integrated tire diameter calculator allows precise fine-tuning for different tires to ensure accuracy of the speed and distance displays. Instruments include a low fuel level warning light. A variety of Genuine Suzuki Accessories for RMX450Z owners are available, including a large selection of Suzuki logo apparel.